Gregory the Great was pope from 590 to 604, a time of great turmoil in Italy and in the western Roman Empire generally because of the barbarian invasions. Gregory's experience as prefect of the city of Rome and as apocrisarius of Pope Pelagius fitted him admirably for the new challenges of the papacy. The Moral Reflections on the Book of Job were first given to the monks who accompanied Gregory to the embassy in Constantinople. This second volume, containing books 6-10, provides commentary on Job 5:3-12:5. Here, Gregory sets forth "a mystical interpretation" of these chapters, showing the way that Scripture foretells Christ's incarnation and that Job himself manifests Jesus' passion. Br. Brian Kerns has been a Trappist for fifty-eight years: seventeen years at the Abbey of Gethsemani in Kentucky, and the rest at the Abbey of the Genesee in upper New York state, interrupted by a year at Oxford, North Carolina, and five years at Genesee's foundation of Novo Mundo in Parana, Brazil. He hails originally from Pottsville, in the anthracite coal region of Pennsylvania. For many years he worked in the library at Genesee and Novo Mundo, and he has interested himself in various translation projects, including translating a book about the Abbot General of the Trappists in the early 1960s, titled Dom Gabriel Sortais: An Amazing Abbot in Turbulent Times. 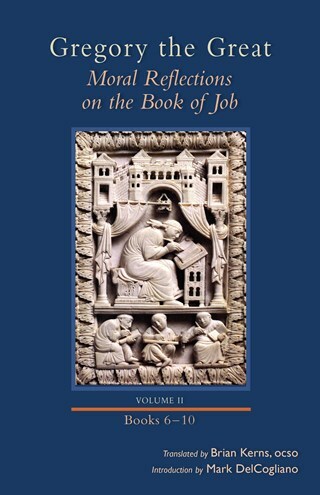 The first volume of his translation of Gregory the Great's Moral Reflections on the Book of Job was published by Cistercian Publications in 2014. When you sign up for a standing order for the six volumes of Moral Reflections on the Book of Job you will receive all of the volumes billed and shipped to you as they are published at a savings of 25% off the cover price! Call 1-800-858-5450 to make sure you don't miss out on this complete commentary on the biblical book of Job from the medieval era. "The Moralia, is a readable and accurate translation with helpful white space at the margins for notes." It recommends itself."